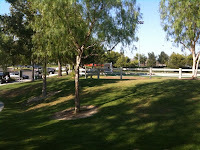 We love the Cox Sports Park in Ladera Ranch, California for a number of reasons. 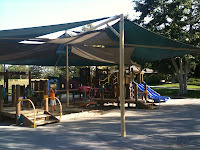 As a Mom, I like the park because it is off of the main road (Crown Valley Parkway), peaceful, yet not far from things. I also really like the park because it is fully covered, so you don’t have to worry about putting sunscreen on the kids, or running home to get it before going to the park. A downside to the park though, is the closest bathroom is quite a distance from the playground and certainly not convenient (it is located at the snack bar area where the four fields come together). I have found this park is great to go to during the weekdays with the kids, I’d just be careful not to go during normal sporting event times, as it can get very congested with spillover parents/kids from the attached fields. 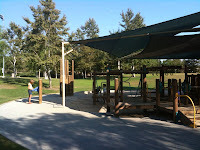 There is a water fountain at the playground and benches for the parents, as well as a large gazebo area available for reservations. The park is located directly across the street from a Burger King, Starbucks, Taco Mesa and Albertsons, so it is quite easy to pick up snacks, drinks and/or dinner to eat at the park. Parking is normally super easy, but again during busy soccer or baseball games, it could be a problem.